Leukemia is a blood cancer that develops from an overproduction of white blood cells are immature. 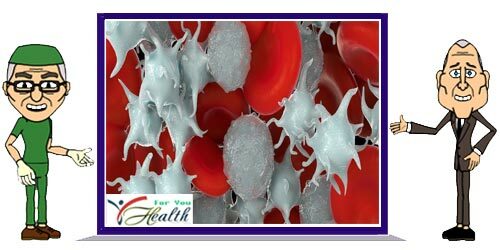 Because the number of white blood cells that are very much in the blood stream and bone marrow, the blood cells are more disrupted manufacturing process. As a result, the white blood cells and other blood cells are not able to function as it should. People with anemia and leukemia are prone to bruising, bleeding, and infection. Leukemia is classified into acute leukemia and chronic leukemia. Leukemia is further classified according to the type of white blood cell involved. No one knows exactly what causes leukemia, but chromosomal abnormalities, exposure to pollution, radiation exposure, and smoking may be a risk factor. Treatment usually involves chemotherapy and bone marrow transplantation. Anemia and related symptoms, such as fatigue, pale lips, pale in the conjunctiva of the eye. The tendency to bruise or easy bleeding, including bleeding from the gums or nose, or blood in the stool or urine. Susceptibility to infections such as sore throat or bronchial pneumonia, which can be accompanied by headaches, mild fever, mouth sores, or skin rash. Swollen lymph nodes, usually in the throat, armpit, or groin. Discomfort below the lower left rib cage (which is caused by a swollen spleen). White blood cell count is very high can lead to vision problems due to retinal bleeding, ringing in the ears (tinnitus), mental status changes, prolonged erection (priapism), stroke, or seizures due to bleeding in the brain. There are things that can be done at home to help manage side effects. If the doctor has given instructions or medicines to treat these symptoms, obey the drugs. In general, the habit of eating healthy menu such as eating a balanced diet and getting enough sleep and exercise can help control the symptoms. Home treatment for symptoms such as nausea or vomiting and address the early signs of dehydration, such as dry mouth or dizziness when in a sitting position to standing. Eating smaller meals can help. Consumption of ginger candy or ginger tea can also help overcome the symptoms. If there are symptoms of diarrhea, consult your doctor to get proper treatment. Feeling very tired. If the patient's lack of energy or the faint easily, try to manage energy and schedule extra rest. Hair loss. Tips include using a mild shampoo chemicals and comb the hair in a gentle way. Pain. Care at home can help you cope with the pain. Handling the stress of having cancer: Cancer patients can fall into stress. Heavy thoughts for the challenges of the disease itself as well as the pain felt need to get the support of family and loved ones. Finding new ways to treat the symptoms of stress can improve the overall quality of your life like doing things that endeared the patient and advise patients to think positively. Share stories and feelings. Finding a support group for others with cancer can ease the mind. The goal of treatment for leukemia is to destroy the leukemia cells and allow the cells to normal blood formed in the bone marrow. Treatment decisions are based on the type of leukemia that is owned, disease stage, age and general health condition. Types of leukemia itself visible through microscopic examination of bone marrow, whether the type lymphoblastic or myeloblastic leukemia. And whether it is acute or chronic leukemia. Plans for the treatment of acute lymphoblastic leukemia (ALL) has three steps consisting of the induction phase, consolidation, and maintenance. Puntuk phase induction therapy is to kill leukemia cells in the blood and bone marrow. This stage treatments including chemotherapy and corticosteroids. Induction usually lasts four weeks and is done in a hospital. But some patients have leukemia cells with specific genetic changes. This gene is called the Philadelphia chromosome. Patients with the gene will be given a tyrosine kinase inhibitor. Consolidation therapy to kill leukemia cells that may remain. If the remaining cells, these cells can grow back and can recur. Treatment may include chemotherapy and bone marrow transplantation. Consolidation typically takes several months but did not require hospital opnam. Maintenance therapy also prevents leukemia cells left over from growing. This can be done by using lower doses of chemotherapy than those used during induction or consolidation. Chemotherapy given with oral medications and injectable drugs intravenously (IV). Performed maintenance therapy for 3 years in a row, but this time, most leukemia patients have relapsed while on maintenance therapy. Treatment for acute myeloblastic leukemia (AML) is based on the genetic makeup of normal myeloid cells. Treatment plan usually has two steps which include remission induction and post-remission therapy. Remission therapy to kill leukemia cells in the blood and bone marrow. Chemotherapy treatment is given by way of intravenous injection (IV). Induction usually lasts 4 weeks, followed three weeks later to restore the bone marrow. Opnam remission therapy usually requires a hospital. Post-remission therapy is done to kill the leukemia cells that may exist even though they are not detected. This therapy may include additional chemotherapy or bone marrow transplant. Chemotherapy may be given to patients in the hospital for a few days every month for 3 to 4 months. There is a subtype of AML called acute promyelocytic leukemia, so the patients received other drugs, such as drug arsenic trioxide and all-trans retinoic acid (ATRA). A stem cell transplant and chemotherapy is also used when the leukemia does not respond to treatment or if AML relapse. Radiation therapy. This can be used to treat swollen lymph nodes due to too many abnormal lymphocytes. Chemotherapy. Chemotherapy is a combination of drugs, including monoclonal antibodies. When CLL do not respond to treatment, or if a relapse of symptoms after the patient had stopped for a certain time, the patient is able to be treated with chemotherapy or bone marrow transplant. CLL patients are not able to fight infection very well. Patients and doctors need to be vigilant and check apakakh no signs of infection, such as pneumonia (lung infection) or fungal infection. Early treatment will help patients live longer. Targeted therapy with tyrosine kinase inhibitors. It was first used for the treatment of CML. Tlang marrow transplant. Before the transplant can be performed, chemotherapy or radiation is used to destroy the bone marrow activity. For people newly diagnosed in the early stages of CML (chronic phase), tyrosine kinase inhibitor can work for many years. If the patient does not show recurrence, patients do not need to do a bone marrow transplant. But if patients relapse, the patient should perform a bone marrow transplant. For people who are diagnosed CML in the later stages (accelerated phase or blast crisis phase), treatment may involve chemotherapy or tyrosine kinase inhibitors prior to bone marrow transplantation to improve the likelihood that a bone marrow transplant surgery. Care for children whose leukemia is not the same as treatment for adults with leukemia. After the leukemia has been treated, children require special monitoring for side effects of treatment that may appear within a few months to a few years later.